I've got a TON to write about, not least of which is Material Color, the show I'm in at the Hunterdon Museum (as well as a terrific Bram Bogart show at Jacobson Howard that couldn't possibly be any more material or colorful) . But that's a reportorial piece, so while I'm working on it, let me connect a few dots for you in this post. Previously I looked at the work of Sharon Butler, Joanne Freeman and Nancy White. 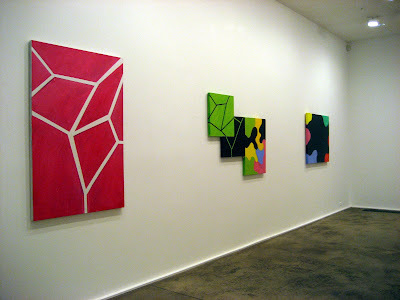 The subject: angular elements in geometric abstraction. 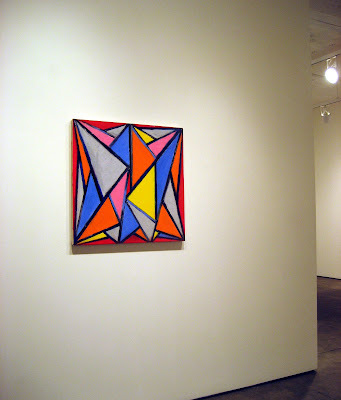 I'd like to continue with some work I saw this past week, paintings whose geometry has a crystalline quality, which is to say that the angular elements are amassed into a larger whole. Thornton Willis, a fave of mine, is in a Gallery Artists show in the enormous second gallery at the Elizabeth Harris Gallery. His painting opens this post. Willis's geometry pushes right up to the picture plane. The angles may suggest a deeper space, but the composition is so insistently two-dimensional--those angles really grip the corners, don't they?--that the image is formally and satisfyingly flat. 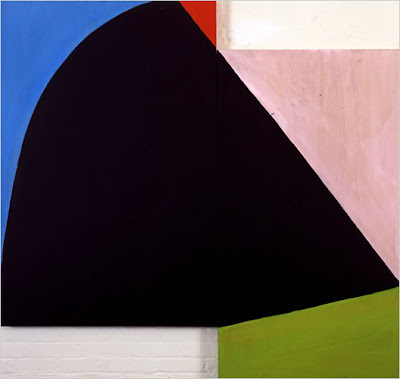 Mary Heilmann, who is having a major moment right now--and long may it last-- is the subject of a small retrospective at Zwirner and Wirth, where the image below was shot, and at The New Museum, where her first museum retrospective, "To Be Someone," will run October 22 through January 26, 2009. I'll have a full report on the New Museum show in a few weeks, but in the meantime, the Zwirner and Wirth show, titled "Some Pretty Colors," was a beautiful show--hot color, often expanding from one canvas to another, restrained by the crispness of her geometry and the parameters of the cool white box. Above: Mary Heilmann at Zwirner and Wirth. 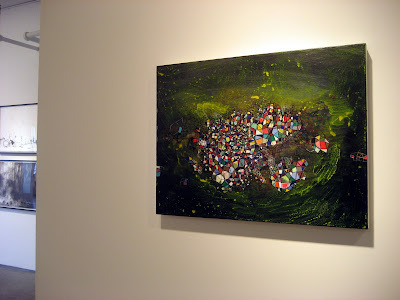 I haven't yet seen the Heilmann painting shown above--it's in The New Museum retrospective (I pulled this image from the New York Times online feature)-- but it provides an excellent formal transition to the work of Chris Duncan, whose solo show, The FaithVoid Split was at the Jeff Bailey Gallery. Duncan is a crafty guy who stitches his drawings together and does installations with thread (there's an enormous mandala-like construction in white thread on a black gallery wall). 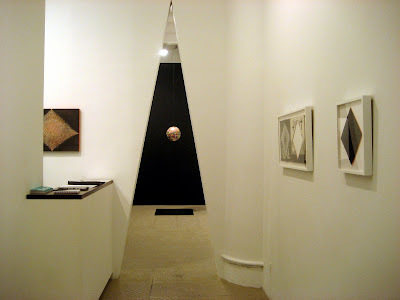 But for this post, what interests me are the angles in his paintings and works on paper--and, as you can see below, the acute-angled doorway through which you enter the show. Go ahead, walk through . . . .
. . . . 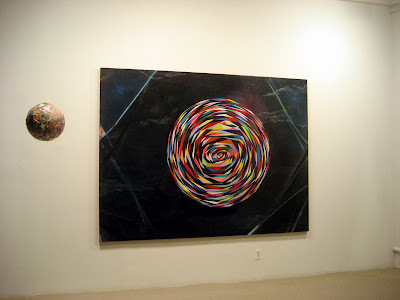 I love this painting, its circle the two-dimensional counterpart to the orb hanging next to it. The angular elements that comprise the circle, and the deep visual space into which the circle is set, give it a pulsing, spinning, throbbing , glowing energy that feels more dimensional than its globular counterpart. At Kinz, Tillou and Feigen, upstairs from Elizabeth Harris, Jennifer Coates shows paintings that contain sprawling crystalline forms afloat in an indeterminate space suggestive of both landscapes and galactic nebulae. The dreamy dimensionality of her work is a nice counterpart to Duncan's tightly wound ball of angles--though they both have a kind of sci-fi quality to them--Heilmann's loose-brushed geometry and Willis's flat formalism. Right Joanne, Willis's paintings are interesting for exactly the reason you mention. Around the turn of the century [no not this one, the earlier one, or 1870s on] people were very interested in space. There was all this stuff about Euclidean and non-Euclidean geometry going on--were those parallel lines ever going to meet? Artists began thinking in completely different, some say ‘irrational’ Ways. Though source has it science was running parallel, keeping up, shooting off on the fast lane, constantly throwing a curve ball right through the whole time and thing. And then there was Simple Logic: A black square. It was said that a black square existed in both inward and outward space. And because of this the world could never feel quite the same again. Of course, most people didn’t get the memo. Back then interests were peculiar. New sensations lead to new questions. Was space real? Is space emotional? What then is the structure and fabric that defines space? That’s got to be the real hard one. Another: Where space and thing interconnect, how do we define that? Well there was plenty of them questions running round the secular right back in the 1500 hum-reds: Noted a few people make good. Today, of course, this is call ‘old’ understanding: Old as in ‘thing’ and ‘space’. Besides It’s something that not a lot of people really wanted to get a non-physical’ handle on. Fair enough, stick to the illusion you are on! I do remember a finger pointing when I asked a silly question about time and space. That lead me to four years foraying @ 4D studies? At least I got the hint of the filmic. Joanne Freeman's top image, Sharon Butler's too, along with Thornton Willis, manipulate space in a very similar fashion …always returning to a sense of flat despite the dazzlingly reads and slips of complex planar shifts’. It doesn't matter that the thing is flat in the first place. It is the sense that it is flat that is important. If you look around, you'll find that there is no short supply of the bulgy. Mary Heilmann’s close image [red and white] toys with the idea of line / surface / plane allowing us to think yet another way about the odd nature of color and its container, street number and house. Nancy is going about it quite different with these new sculpture paintings. That's a whole different story. Abstract, concrete, are getting good plugs right now, though people are still a little cautious when someone starts talking complex space existing on a two dimensional surface. We may need to run parallel for a short time to get the curves and quantum in. Of course an acute angle always has an obtuse, right? That's how we get Mt Fuji. Thornton Willis is a very nice guy. He actually handed the interview I had with him out during his retrospective. At least that is what he told me. He also gave me some feedback about my paintings. That was one of the best experiences I've had doing the interviews.